The new range meets the revised EN 388:2016 standard whilst educating employers about the changes to cut level testing. Between 2016/17, there were over 17,521 non-fatal injuries affecting the hand and wrist. 12,325 of these instances resulted in workers needing to have over seven days’ absence . Hand injuries continue to be the leading cause of workplace injury and these could be prevented through workers wearing the right gloves for the job, with proven protection that is compliant to safety standards. 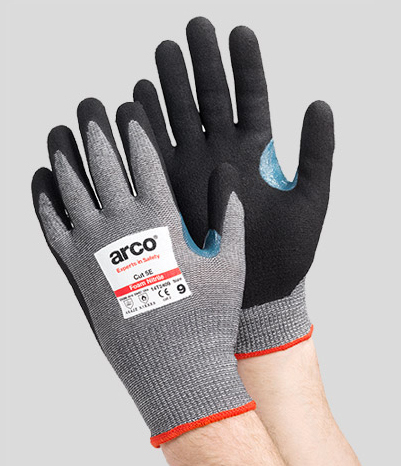 Arco’s high cut resistant gloves continue to offer high level protection and undergo rigorous testing in the company’s independently accredited Product Testing Laboratory to ensure this. There are 11 products in the range that has been revamped to become more lightweight, comfortable and durable, whilst still achieving high cut protection levels in line with the new protocols of EN 388:2016. The gloves are also available in various coatings including: polyurethane, sandy foam nitrile, nitrile dots, latex and leather. EN 388:2016 superseded the original cut glove standard from 2003 and tests gloves against mechanical hazards such as abrasions, blade cuts, tears, punctures, and impact. The new cut testing process is designed to better stimulate real-life situations, such as an accidental cut, and is particularly relevant where injuries are likely from heavier objects or undergo greater force. By 21st April 2019, all safety gloves must be compliant to this standard.